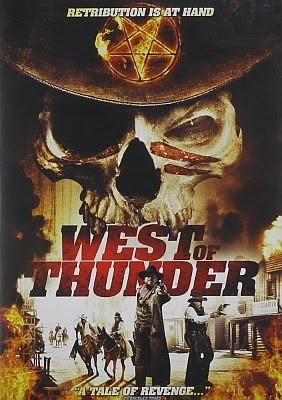 After an introduction that soberly recounts the infamous massacre at Wounded Knee, I was expecting WEST OF THUNDER (2012) to be some sort of preachy tract. Fortunately, there's more to it than that--it's actually only semi-preachy, with enough entertainment value to make it passably diverting and an overall air of supernatural oddness which, at times, makes it come off as downright peculiar. 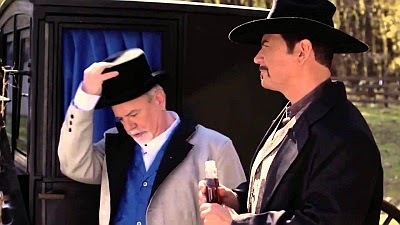 A tall, dark stranger named Henry Seed (Dan Davies, ED GEIN: THE MUSICAL), who looks like something out of a spaghetti Western but with a decidedly more placid and wry demeanor, comes striding out of the desert and into a small South Dakota town in 1899. In a rather on-the-nose way, his first words to himself echo the film's main theme: "Silence in the face of evil is itself evil." Thus begins Henry's mysterious mission to avenge the wrongs committed against the Lakota, the remnants of whom reside on a nearby reservation, in a variety of ironic ways best described as "poetic justice." A man who received a medal of bravery for killing innocents is compelled to commit suicide; another man who once denied starving Indians any of his surplus of food one winter sees all the stock in his store go rotten after Henry, Mandrake-like, waves his hand over it; and so on. But Henry doesn't just go around beating people up. The most interesting thing about these revenge scenarios is the way he engages his victims in deceptively calm discussions of morality before confronting them with their crimes. And then he beats them up, or better still, levels some other kind of poetic justice against them for, either by action or inaction, doing wrong against the Lakota. Another interesting aspect of the story is the fact that the Lakota themselves aren't too sure how they feel about this. They know Henry is some kind of dark spirit of vengeance from the West (this somehow has great significance), yet they aren't all eager to follow his path. This will eventually lead Henry to take what I found to be an unexpected course of action, one which bypassed the usual dramatic finale found in most Westerns in favor of an ending that is willfully anti-climactic. Odd. WEST OF THUNDER proceeds at its own deliberately slow, placid pace, alternating eerie moments of fitting revenge with thoughtful philosophical interludes. The film has a low-budget indy feel, unrefined and rough-hewn at times but also pleasingly stylish, with some terrific interior and exterior locations and nice period detail. Dan Davies makes the character of Henry Seed interesting by never overplaying or trying too hard to be scary or intimidating, and the rest of the performances are good as well. The DVD from Indican Pictures is in 1.85:1 anamorphic widescreen with Dolby 5.1 surround sound. I reviewed a barebones screener but the finished product is supposed to include a short documentary entitled "Mitakuye Oyasin: We Are All Related." A sober attitude in regard to its subject matter keeps the film from descending into silliness or resorting to shock value or empty sensation. And once I realized there wasn't going to be a big finish, I was okay with how the story just kind of drifted to a stop. WEST OF THUNDER, strangely enough, seems satisfied to be little more than a pleasantly unexciting diversion with a thoughtful message. MONDO RONDO! Rondo Award Winners Announced! Alchemy Acquires Bernard Rose's "FRANKENSTEIN"